More information will be listed on our website and is also available at this link. Join us! Sign up here for potluck. With the arrival of Holy Week on April 14, the most solemn liturgies of the year will be upon us, culminating with the celebration of the Lord’s Resurrection at Easter. From the most ancient days of the church, Easter has been the privileged time for Baptisms. “Baptism” comes from an every-day Greek word that means to immerse or soak something, such as a sponge in water. As we renew our own Baptism at Easter, we recall how St. Paul tells us that we are “baptized” or immersed in the life of Jesus, especially in the mystery of his dying and rising. Allow the great liturgies of Holy Week to do this for you, to immerse you; let us soak ourselves in these grand rituals and sacred narratives. Let the stories and symbols wash over you. Gradually their water, their wisdom, their grace will seep into you, no matter how dried out you feel, until you are filled, saturated. We soak ourselves – maybe ‘marinate’ is also a good word – in the great mysteries and questions of our human lives portrayed in Jesus: the suffering of the innocent, rejection and betrayal, human brutality and violence, the poor crushed by the powerful; self-sacrifice for others, commitment and fidelity unto death, compassion, forgiveness, and love. How our hearts warm with hope when we see which of these forces triumph in the end. We are raised up by the Spirit of Jesus to share in that Life, that Love, which triumphs over all, which is eternal. Come and soak a while in these healing waters. 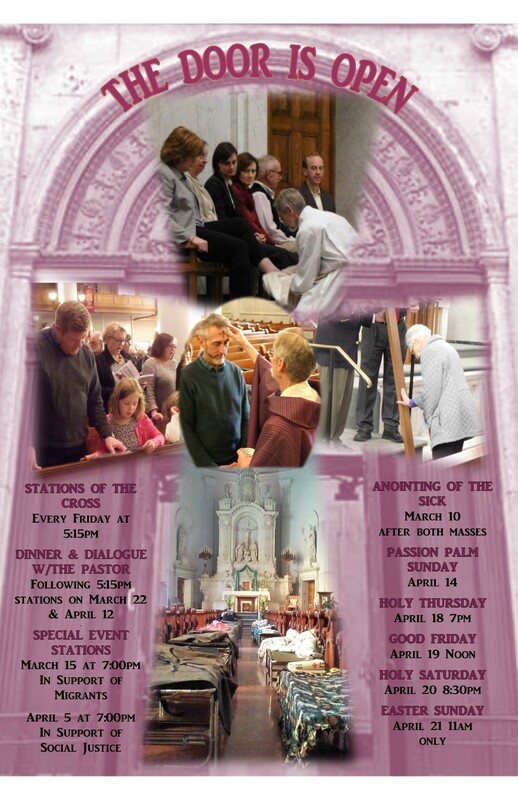 Before Holy Week itself arrives, we observe the Stations of the Cross (see sidebar): tonight, April 5, also with Social Justice Stations; and April 12, followed by a simple soup supper and my presentation on how contemporary Jesuit spirituality can apply in our own lives and in our parish. Looking ahead, I call your attention to our new parish-wide service day on April 27, described below with a request to sign up by next Wednesday, April 10. A couple of ‘save-the-dates’: May 16 for the next Jesuit Alumni luncheon, about Blessed Solanus Casey; and May 30 for a Jesuit evening here on art and spirituality. Looking for Lenten prayer helps? – check out ignatianspirituality.com, sacredspace.ie, or pray-as-you-go.org. You may have noticed that we have some new things going on here at Ss Peter and Paul. One of these is that we will now be hosting parish-wide service events around the city. Our inaugural event is Saturday, April 27 at Belle Isle, a chance for us to get out and celebrate Earth Day, our fair city, and our parish community. 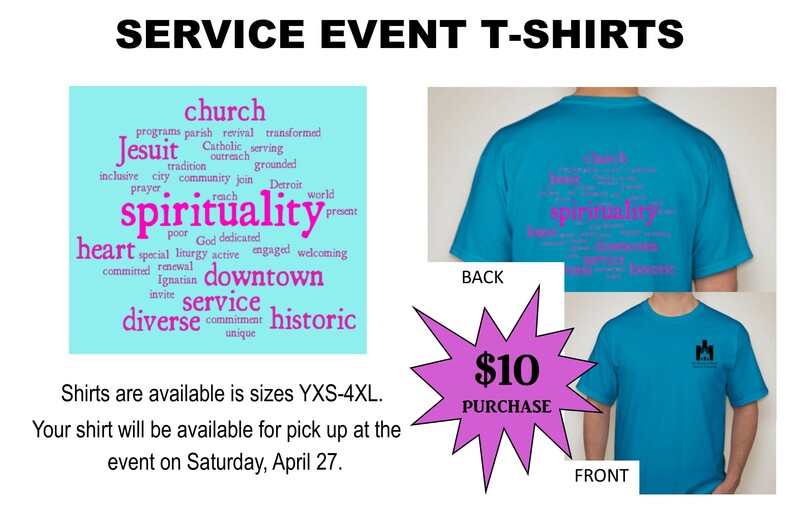 The event is free, but we are ordering t-shirts that we will use for future events, so if you would like one for $10, please order by April 10 so that they come in time for the event. You can do this when you register on our website. So, come on out and show the city that we are a resurrection people! Register today and order your T-Shirt here! Join us for our monthly Happy Hour this Thursday, April 11, at The Detroiter (655 Beaubien) from 5:30-7:00 p.m.
We will not be holding the Second Sunday Social after the 7:30 p.m. mass on April 14 or Scripture Reflection on April 17 in observance of Holy Week. 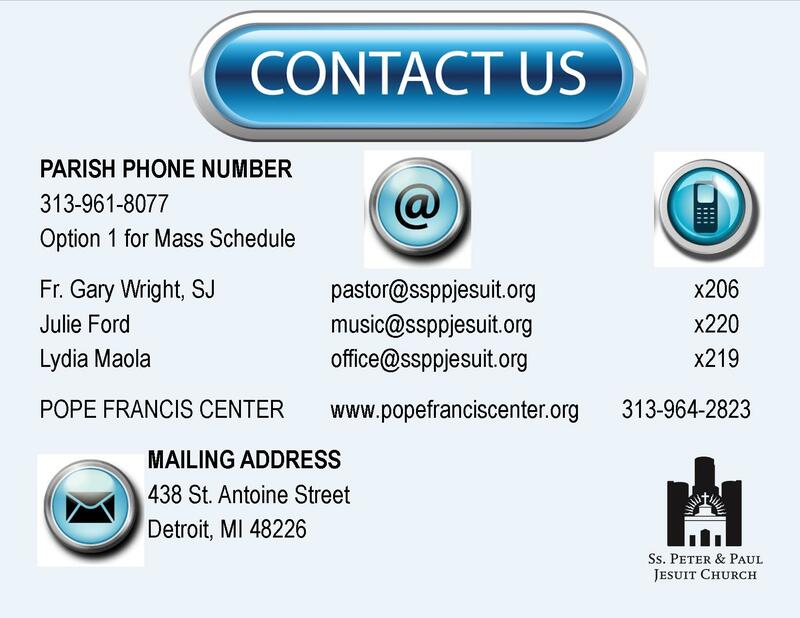 For more information about Faith in the D and Young Adult programs, contact Mara by email or in the parish office at 313.961.8077 x204. I was talking to a friend one evening while our kids were downstairs playing. She was telling me that she ran into the parents of our kids’ classmate, and they had invited her and her son to join them at their church. I was suddenly aware of feelings of surprise and also shame creeping up in me. Surprise because she seemed so casual about accepting the invitation. Shame because I never had the courage to invite her to attend MY church. I always had good excuses in my head. I don’t know if she is Catholic. It’s too far of a drive. I don’t want her to feel obligated because we’re friends. What if it pushes her away? I’m afraid of being rejected. It can be hard to invite someone to come to church. As a church leader, I have learned that personal invitation is the single most powerful means through which people begin to attend and eventually get involved in a church community. I know that in my head, but it can be intimidating to apply it in real life. It is very real to feel afraid of being rejected or coming across as pushy. I’m here to tell you, these feelings are normal and we all get them. But more importantly, I am reminded that if we push past those feelings and have the courage to extend the invitation, it might actually be accepted. We’re coming up on Easter, and that is a fantastic time to invite a friend to come to church with you. Our Holy Week liturgies are going to be spectacular – complete with powerful homilies from Fr. Gary, and beautiful music from our choir and special guests. But you don’t have to wait for a special occasion to extend your invitation. If you’re still feeling nervous about inviting a friend to Mass we also have some other special events coming up, including a great service event at Belle Isle on April 27 and an interesting evening program on art and spirituality, led by Fr. Peter Fennessy, SJ, on May 30. So I would like to encourage you to invite someone to our church this spring. Ss. Peter and Paul Jesuit parish is growing. We can continue to grow, but it will take all of us working together to make it happen. We look forward to meeting your friends soon! Looking for a way to get involved during Holy Week? Adoration after the Mass of the Lord's Supper will continue into the evening. 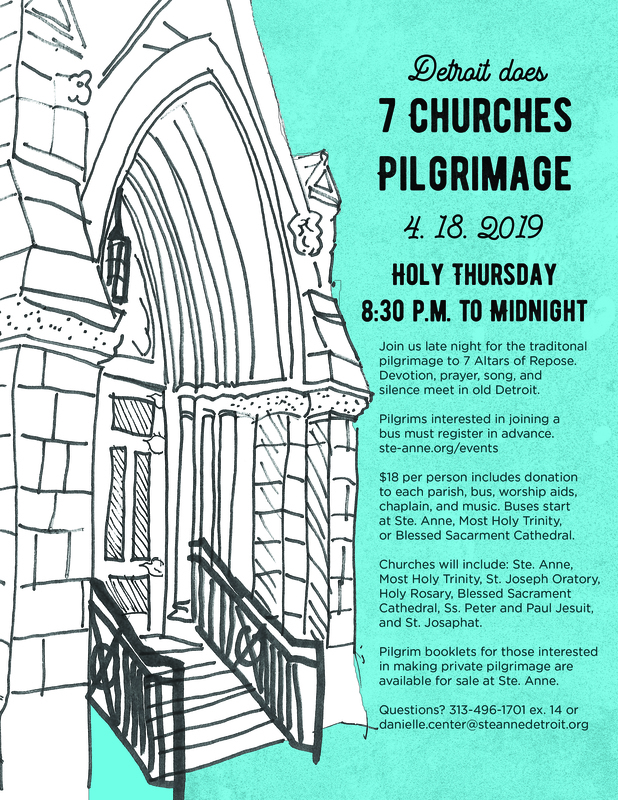 During that time our parish will be visited by pilgrims from all over metro Detroit as part of the Seven Churches Pilgrimage. We need parishioners on hand to host our visitors. If you are interested in helping, contact Julie for more information. Baptism Prep: Anyone interested in preparing for infant baptism in the next 6 months, please contact Julie for more information on how to be scheduled for upcoming sessions being planned.